See another side to Melbourne when you take a trip to Dandenong. Once a separate city, Dandenong, 30kms from the CBD, became part of Victoria’s capital in the 1960s and still maintains its own culturally diverse character. Delicious food from around the world, pleasant parks and market shopping are just a few of the things to enjoy in Dandenong, so book your Dandenong hotel with us today! If you’re looking for a place to tempt your tastebuds, you won’t be disappointed. A dazzlingly multicultural area, Dandenong is home to its own Afghan cultural precinct on Thomas Street with authentic Afghan restaurants, as well as groceries and fashion. Little India on Foster Street provides – you guessed it – a taste of Indian food and clothing. If you want to shop, you can take your pick. The Dandenong Plaza Shopping Centre offers mall shopping and a couple of food courts, and a selection of shops lines the long stretch of Lonsdale Street. Dandenong Market provides fresh produce four days a week and a family fun day on Sunday with free entertainment and outrageous characters. Need a little drama in your life? The Drum Theatre is a 521-seat performance space inside the heritage-listed former Dandenong Town Hall, and it offers plenty of fresh performances for an entertaining night on the town. There are also many parks in Dandenong, offering visitors plenty of places to chill out with picnic areas, walking and bicycle tracks and spots for the kids to play. Greaves Reserve, the site of the Dandenong Show each November, is a home to sports clubs and a place to get active. The Dandenong Creek Trail is a path for both walkers and cyclists that winds along the Dandenong River from Carrum to Ringwood. At 43km, you could be forgiven for not walking the whole thing, but take on a section of it and you may see a range of sights from bridges to parks and wetlands. Perhaps one of the most compelling reasons to stay in Dandenong is the chance to discover the Dandenong Ranges, just a 40 minute drive away. Dominated by the 633-metre Mount Dandenong, this collection of mountain ranges is a great place to explore, with fern gullies, mountain ash trees and quaint, artistic villages like Olinda and Sassafras. Don’t forget that when you stay in Dandenong, you’re only a train ride away from the Melbourne CBD, a city known for great food, shopping and culture. So wot’s the hold up? 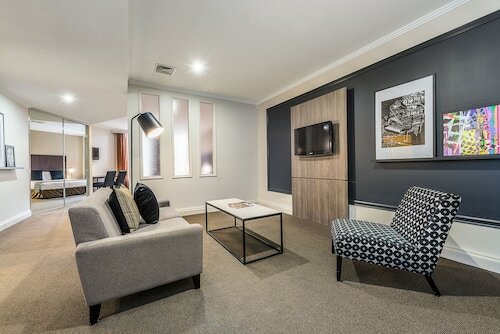 Book your Dandenong accommodation now, because you can’t go wrong with Dandenong! How Much is a Hotel Room in Dandenong? Hotels in Dandenong start at AU$76 per night. Prices and availability subject to change. Additional terms may apply.